Starting a research program at your new institution can be exciting, but daunting. The resources below are designed to give you information and advice on building on or moving beyond your graduate research and on starting up a new lab. This includes setting up your lab space and getting instruments/equipment as well as attracting quality graduate students. Subsequent pages provide information and tips on finding funding and on getting published. 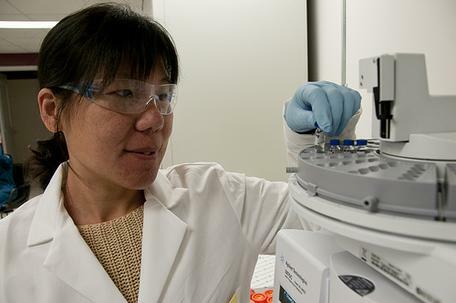 NCTR scientist conducting mass spectrometry experiment. Sowing the Seeds of a Solid Research Program (Acrobat (PDF) 482kB Mar19 12) - This presentation was given by Christine Ortiz (MIT) at the 2010 Minority Faculty Development workshop. The presentation slides offer information and advice for current trends in research, how research is evaluated, how to select and construct a coherent research project, writing a grant proposal, and tips on networking with and/or finding mentors, collaborators, and graduate students. Building Your Lab - Transitioning to Independence (Microsoft Word 49kB Mar19 12) - This handout, by Rebekah Drezek (Rice University), was presented at the 2008 Minority Faculty Development workshop. The one-page handout provides helpful tips for building your lab, including how to cultivate mentors and colleagues, gaining recognition and an independent identity in your research, developing and improving upon your leadership and management skills, staffing your lab, and time management. Developing Your Research Plan and Program (PowerPoint 1.7MB Jul30 12) - This presentation was given by Stephanie Adams (University of Nebraska) at the 2008 Cross-Disciplinary Initiative for Minority Women Faculty conference. It provides tips for planning and developing a research program. The CFM Lab at Georgia Tech and Emory (PowerPoint 24.4MB Jul30 12) and accompanying video file ( 15.4MB Jul30 12) - This presentation, by Ajit Yoganathan (Center for Innovative Cardiovascular Technologies) at the 2012 Minority Faculty Development workshop, showcases some of the projects and developments taking place at the Center for Innovative Cardiovascular Technologies. Developing a Research Program, from the On the Cutting Edge project, offers pages with resources on topics such as planning your research program, getting funding, collaborating with students, setting up your lab and obtaining equipment, time management, and publishing your work. Although these pages are written for geoscientists, most of the information is applicable for faculty members in science or engineering. Keeping Your Research Alive, by Rick Reis. How to make your research a priority, in the face of other, more urgent (but not necessarily more important) demands on your time. Argonne scientist Karena Chapman holds a diamond anvil cell next to collaborating scientists Peter Chupas and Gregory Halder. Provenance: Photo by George Joch. Image courtesy of Argonne National Laboratory. How to Mentor Graduate Students, from the University of Michigan Graduate School, offers suggestions for being a mentor to your graduate students and provides links to addtional resources on the topic. Making the Right Moves: A Practical Guide to Scientific Management for Postdocs and New Faculty, a free publication from the Howard Hughes Medical Institute, offers a collection of practical advice, experiences, and opinions from seasoned biomedical investigators and other professionals. For a down-to-earth guide to setting up and managing your new lab, read At The Helm: Leading Your Laboratory, by Kathy Barker. Career Trends: Running Your Lab is a free booklet, available from Science Careers when you set up a free account (the link above will direct you to do so). It includes advice on managing people, time, projects, and budgets.